Over the weekend I was reading a book on Jazz harmony and I stumbled upon on a very interesting and useful topic-guide tones. You probably have never heard of them before. I found that this little piece of knowledge is extremely useful when you are writing a melody,riff or jazz line on the guitar. This technique will also train your ears and help you to hear chords and the notes within each chord. let me explain this chord. The guide tones are 3 and 7. So you will be able to play E and B over a Cmaj7 chord. The guide tones are the most distinct notes in any chord. Using the two guide tones will help you when you are writing a blues riff or a jazz riff.You can create complex or simple melodies by building off of these two notes. They are almost like “anchor” notes in a chord that guide the melody. I have been able to create cool jazz/blues riffs with this simple two note technique. The guide tones for this minor seventh chord are: C and G.
Lets know take a look at a 2-5-1 chord progression in the key of C major. The guide tones for these three chords are: F,C(Dmin7) B,F(G7) and E,B(Cmaj7). Can you see the 2 note pattern? Try and write a melody with these guide tones. 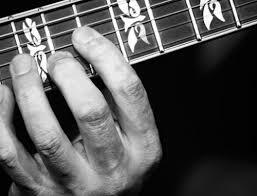 You will need to understand how to build chords in order for you to understand guide tones.They will start to guide your ears and fingers when you are playing a melody on the guitar. I have been studying music theory for a long time and guide tones, in my opinion are the backbone to writing melodies. Who would have thought that just two notes can make such an awesome difference while playing the guitar. Keep practicing scales,arpeggios and guide tones. These 3 techniques will improve your playing significantly.